Woot! I finished! Late, late last night I finished reading The Bone People, by Keri Hulme. I will be posting that review later today. But for now, here is my wrap-up post of the Spring Challenge 2007, hosted by Katrina over at Callapidder Days. I really like the format Katrina suggested for the wrap-up post, so I will probably be using a similar format for all of my challenges. Overall, I read a total of 17 books this spring. What was the best book you read this spring? My favorite book this spring was one I had picked for this challenge, Purple Hibiscus by Chimamanda Ngozi Adichie. I was struck by the beautiful imagery and lyrical writing; it is a story that will not quickly fade from my memory. What book could you have done without? I liked all of the books that I picked for the challenge. Out of all the books I read this spring, the only one I could have done without was The Mermaid Chair by Sue Monk Kidd. My least favorite of the challenge books was Digging to America. Did you try out a new author this spring? If so, which one, and will you be reading that author again? The only new authors amongst my challenge books were Keri Hulme and Vikram Chandra, although I only read Anne Tyler and Chimamanda Adichie for the first time this year. I would like to read more by Keri Hulme, but most of her other work is short stories, which aren't usually my cup of tea. Maybe someday I'll try them out. I will definitely be reading more by Vikram Chandra. Other new authors this spring include Kiran Desai, Ann-Marie MacDonald, Laura Esquival, Ina May Gaskin, Umberto Eco, and Jennifer Weiner. I liked them all. If there were books you didn't finish, tell us why. There were no books that I did not finish. What did you learn -- about anything -- through this challenge? I learned that maybe I should ease up a little on the challenges. I have a feeling I would have enjoyed The Bone People just a little bit more than I did if I didn't put such pressure on myself to finish it by today. 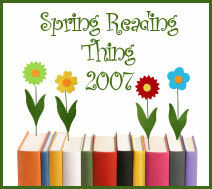 What was the best part of the Spring Reading Thing? Two things: reading great books; and looking at the great books others read. Would you be interested in participating in another reading challenge this fall? Not this year, as my autumn is going to be pretty chaotic. Thanks Katrina, for hosting this wonderful challenge! Thanks for being part of the Spring Reading Thing! I'm sorry you won't be able to join us this fall, but I completely understand. Good job getting through all your challenge books! I must get my hands on a copy of Purple Hibiscus. Vikram Chandra is another author I've been wanting to try. Like you, I acknowledged with this challenge that maybe I needed to ease up a little. It is easy to get caught up in the enthusiasm of participating in a new challenge, but realistically it can be a strain to fit in all the books. @katrina - Thank YOU Katrina! It was a fun challenge to be a part of. 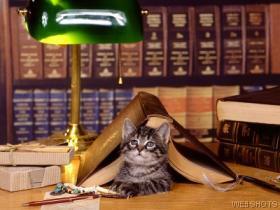 @literary feline - Thanks! I've been witholding from some new challenges that are popping up for the fall and winter, but you're right, it's hard!